The Alzheimer’s Foundation of America (AFA) will host an educational conference on Alzheimer’s disease on May 18, 2012, in New York City. The conference is free and open to the public. The event, entitled “Five Boroughs Concepts in Care Conference,” takes place throughout the day at the Crowne Plaza Hotel in Times Square. The conference is care-focused, and will feature practical ways to meet daily challenges. There will be separate presentations for people with Alzheimer’s or a related dementia, medical providers and family members. The keynote luncheon speaker will be David Cassidy, the multiplatinum recording artist best known for his role on “The Partridge Family.” Cassidy’s will share “A Son’s Story,” speaking about his mother’s struggle with Alzheimer’s disease since her diagnosis seven years ago. Joy Bauer will also make a presentation at the conference. The best-selling author and nutrition and health expert for the “Today” show will share her ideas on lifestyle choices that promote brain health. Also on the agenda is Teepa Snow, a renowned expert in dementia care, and Max Rudansky, M.D., who is Huntington Hospital’s chief of neurology. Alzheimer’s disease is the most common form of dementia, affecting up to 5.1 million Americans, including approximately 450,000 New Yorkers. Alzheimer’s is a progressive brain disorder that results in loss of memory and impaired cognitive functioning. The Alzheimer’s Foundation of America, based in New York, is a national nonprofit organization which brings together more than 1,600 member organizations to provide education and caring resources to people affected by Alzheimer’s disease. To find out more about the conference, visit http://www.alzfdn.org. An appropriate diagnosis can help an aging individual and their loved ones plan for the future. Being proactive in the early stages can allow a person a chance to make long-term decisions about their care, living arrangements, finances, and legal concerns. This allows a person more opportunity to benefit from advanced medical care and support services so that the aging process and effects of the disease are managed better. 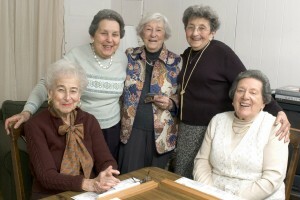 To learn more about New York elder law or New York estate planning, visit http://www.elderlawnewyork.com.